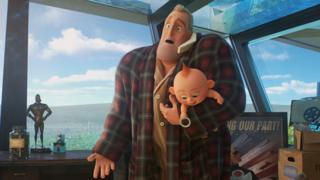 One of the most memorable lines of dialogue in The Incredibles 2 comes from Bob Parr, the father of the superhero family. He is seen slumped on the couch. Unshaven. Exhausted. Bob is struggling to get his head around his son's maths homework. His teenage daughter is having romantic trouble. And his baby boy needs constant attention. "I just need a little 'me time'," he says. It's the kind of sentiment we're used to hearing from on-screen mothers, but less often from dads. However, one reason the sequel to 2004's The Incredibles has caught the attention of critics, and the imagination of audiences, is the role reversal at its core. The Incredibles 2, released in the UK this weekend, sees mother Helen - or Elastigirl, to use her superhero alter-ego - go out to fight crime, while father Bob stays at home to look after the family. "The gender role-swap is pulled off with an explicit sensitivity and awareness of the issues at play," wrote Scott Mendelson in Forbes. "While Bob initially struggles with his Mr Mom role and is a little jealous that his wife is essentially living out his fantasy, he quickly comes to terms with it and adapts to his new family-rearing responsibilities." The Incredibles 2 sees Helen become the face of a campaign to "make superheroes legal again" and fight a new villain known as ScreenSlaver. Her husband's recklessness and tendency to say "the insurance will cover it" as he causes carnage in the name of fighting crime is precisely why Elastigirl, with her less damaging and costly approach, is chosen to rebuild the reputation of superheroes. 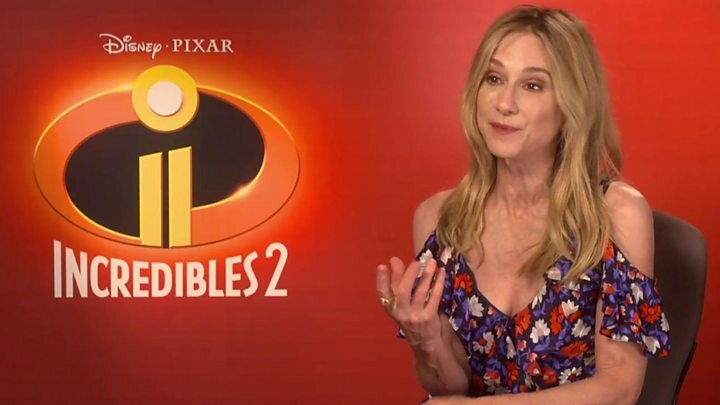 Actress Holly Hunter, who voices the character, says she hopes the film opens the minds of both audiences and those within the film industry. "This is something we need to have in our cinema, in our lives, in our reference points, in our goals," Hunter tells BBC News. "For a woman to lead, for a woman to be able to be the problem solver in the room, I think there's nothing but good that can come from that." It may be an unusual family set-up for a Hollywood film, but it hasn't put audiences off. Since its release last month, The Incredibles 2 has already become the highest-grossing animated film of all time in the US, overtaking the previous record held by Finding Dory. Its box office success is arguably down to the 14-year gap between the first and second films. In addition to the families buying tickets for young children, the nostalgia factor is attracting millennials who were kids when the first film came out. There is continuity with the first film - all the voice actors have returned to reprise their roles, while Brad Bird is once again in the director's chair. But, Hunter says: "Brad is not a message film-maker, he doesn't make message movies, and I don't think that was his intention with this at all. "But I do feel that a result of the movie - whether it's a purposeful result or not doesn't even matter - the rush that you get from seeing a woman hero is kind of emotional." She goes on: "I think audiences feel a certain gestalt seeing a female act heroically. And still remain female. Still remain a woman, not a woman who's trying to be a man. Who's very much in her own element." Seeing a man staying home to care for his family arguably shouldn't be unusual in 2018 - although statistics show they are still firmly in the minority in the UK. There are around 235,000 stay-at-home fathers, according to the latest ONS figures, compared with 1.7 million mothers. While women who look after the family significantly outnumber men, Hunter says there are clearly enough stay-at-home dads to warrant there being more of them in Hollywood. "I think there's such an appetite for it that is unspoken for most people, in a way that might not even be identified, that you have an appetite to see it, but we all do," she says. "It feels satisfying to see a strong female, and so I think Elastigirl answers a lot of that social need, a cultural desire." Referring to Bob Parr's request for some "me time", Hunter is willing to cut him some slack. "Proper parenting is truly heroic work," she says. "So anybody who is taking care of kids, if it's a nanny, a grandmother, a brother or sister, they're going to want some 'me time' at the end of the day. "It's unrelenting, chaotic, unimaginable work, until you do it. And genderless." The Incredibles 2 is released in the UK on Friday.